Avon Products, Inc. was having significant problems with the sales staff. The company’s business, dependent on sales representatives, was facing a shortage of sales reps without much hope of getting new ones. Regression models were developed to reveal the possible variables that were fueling this situation. The models revealed that the most significant variable was the level of the appointment fee that reps pay for materials and second was the employee benefits. With data to back up its actions, the company lowered the fee. Many retailing experts suggest that electronic shopping will be the next revolution in retailing. Whereas many traditional retailers experienced sluggish, single-digit sales growth in the 2000s, online sales records were off the charts. Although e-tailing continues to make up a very small portion of overall retail sales (less than 5 percent in 2009), the trend looks very promising for the future. A research project investigating this trend looked for correlates of consumers’ preferences for electronic shopping services. The explanation of consumers’ preferences was sought in psycho graphic, demographic, and communication variables suggested in the literature. • How strongly are sales related to advertising expenditures? • Is there an association between market share and size of the sales force? • Are consumers’ perceptions of quality related to their perceptions of prices? In situations like these, the product moment correlation, r, is the most widely used statistic, summarizing the strength of association between two metric (interval or ratio scaled) variables, say X and Y. 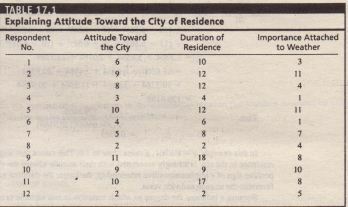 It is an index used to determine whether a linear, or straight-line, relationship exists between X and Y. It indicates the degree to which the variation in one variable, X, is related to the variation in another variable, Y. 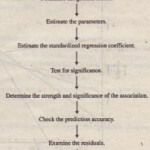 Because it was originally proposed by Karl Pearson, it is also known as the Pearson correlation coefficient. It is also referred to as simple correlation, bi-variate. • How strongly are sales related to advertising expenditures when the effect of price is controlled? • Is there an association between market share and size of the sales force after adjusting for the effect of sales promotion? As in these situations, suppose one wanted to calculate the association between X and Y after controlling for a third variable, Z. Conceptually, one would first remove the effect of Z from X. To do this, one would predict the values of X based on a knowledge of Z by using the product moment correlation between.X and Z. The predicted value of X is then subtracted from the actual value of X to construct an adjusted value of X. In a similar manner, the values of Y are adjusted to remove the effects of Z. The product moment correlation between the adjusted values of X and the adjusted values of Y is the partial correlation coefficient between X and Y. after controlling for the effect of Z. and is denoted by r,,:o. Statistically, because the simple correlation between two variables completely describes the linear relationship between them, the partial correlation coefficient can be calculated by a know ledge of the simple correlations alone, without using individual observations. Partial correlations have an order associated with them. 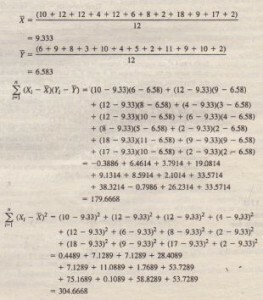 The order indicates how many variables are being adjusted or controlled. The simple correlation coefficient, r. has a zero-order, as it does not control for any additional variables when measuring the association between two variables. The coefficient is a first-order partial correlation coefficient, as it controls for the effect of one additional variable, Z. 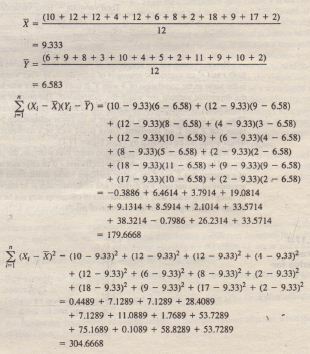 A second-order partial correlation coefficient controls for the effects of two variables, a third-order for the effects of three variables, and so on. The higher-order partial correlations are calculated similarly. The (n + I)th-order partial coefficient may be calculated by replacing the simple correlation coefficients on the right side of the preceding equation with the nth-order partial coefficients.